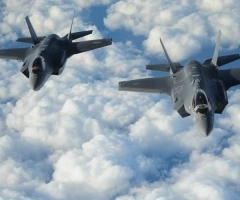 While no decision has been made yet, US officials confirmed that Washington was considering halting steps now underway to ready Turkey to receive the F-35, which is built by Lockheed Martin Corp. “There [are] decisions that come up constantly about things being delivered in anticipation of them eventually taking custody of the planes,” said Wheelbarger. “So there’s a lot of things in train that can be paused to send signals to them [that we’re serious],” she added, without detailing those steps. “This [the F-35 standoff] is really a symptom, not a cause of the problem between the two countries,” Aliriza said. “It’s prudent program planning… to ensure that you have stability in your supply chain,” she said, without speculating that Turkey might be dropped from the program.